We have data in hand, including put-call-ratio readings, that say the October 29 intraday low of 2,603 has similar characteristics to bullish reversal points that held in the past. We also know the October 29 low represents a higher low relative to the February 9 low. The chart below is during Monday’s session with the S&P 500 down 33 points. Concerns would increase if the October 29 low is exceeded, especially for more than a relatively short period of time (a few hours or a few days). Given the market’s renewed weakness during Monday’s session, it is prudent to have a detailed bearish game plan in place. Our plan is to step out in an incremental fashion based on specific levels. If the market holds above the levels, we will sit tight. If the levels are violated on a closing basis, we will take action. Since markets can bounce back before the end of a week, a weekly close below a predetermined level would be more concerning than a daily close. The size of our incremental steps will be based on the hard data/model readings. While retests and pullbacks never feel good, price action earlier this year illustrates that bounces can be sharp. Our predetermined levels respect that many stops are set in the same logical areas, which can cause markets to overshoot those levels and reverse once all the stops have been triggered. We covered the 2011 case in a recent post, which provides an overshoot example during the retest of a prior low. The chart below is during Monday’s session with the S&P 500 down 45 points. The market still has numerous forms of possible support below. If all levels in our step-out plan are violated, the model will most likely be moving to 100% cash. If the bond market can catch a strong bid, the math may allow for a cash/bond mix. During Monday’s session, the long-term Treasury ETF (TLT) was oscillating between a small loss and no change. A big bullish spike in bonds would also increase stock market concerns in the coming days and weeks; it may happen soon, but it has not happened yet. Flips between improvement and deterioration are not uncommon during periods of volatility and consolidation (see charts below). No one knows how 2018 is going to play out. A fact-based case can be made for both the big-move-up and big-move-down theories. Typically (not always), if we can step back from the day-to-day swings in price and our emotions, we will have time to prudently get allocated in line with the evidence, regardless if the outcome is wildly bearish, as it was in 2007, or wildly bullish, as it was in 2016. The vast majority of common investing and trading missteps are related to having a very short-term focus and making changes based on short-term fear. The market will eventually tip its hand in the “new downtrend” or “correction followed by a new uptrend” direction. If we can shift our focus to the bigger picture, the odds of success will increase significantly. If we remain focused on daily fluctuations and short-term outcomes, the odds of success will decrease significantly. 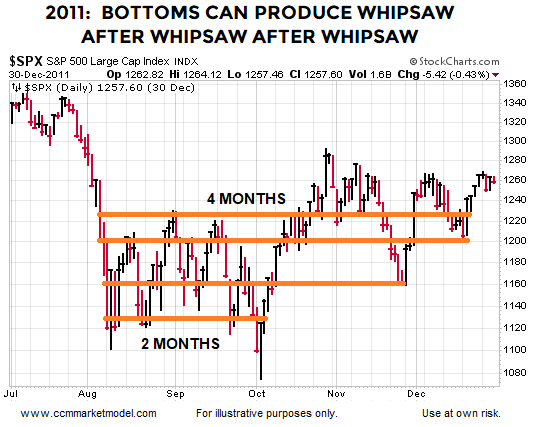 The market has shown numerous signs of trying to make a bottom, but still has a lot to prove. The short and intermediate-term data remains unquestionably concerning. If we execute in a cool, calm, and collected manner, we can balance the need to protect capital with the risk of overtrading and dying a whipsaw-induced death of 1000 cuts. It is not unusual for the market to be extremely volatile and frustrating while trying to form a lasting bottom. We are not making any assumptions about whether or not our predetermined levels will hold. We may do nothing in the coming weeks or we may migrate to a 100% cash stance. The market and the data will make the calls. The charts covered on October 30 remind us how helpful it can be to think about day to day swings in the context of the bigger picture. Older PostHOW STRONG IS THE RECESSION/BEAR MARKET CASE?